In this increasingly fraught world, it’s only really Whiskers adverts and tales of great sporting triumph that can raise a smile from my cynical chops. 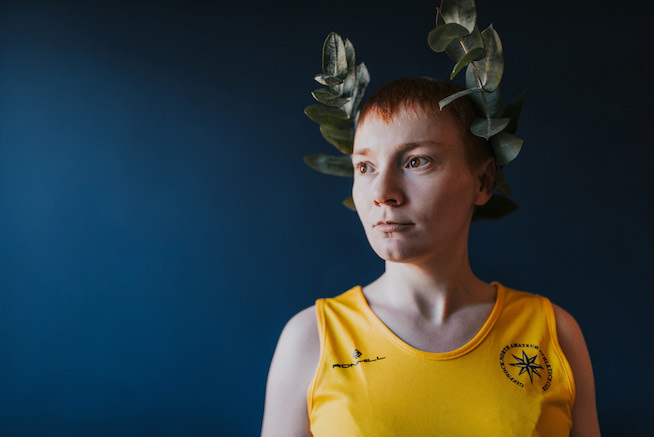 So I was intrigued to hear about Lauren Hendry, a theatre producer who decided to try her hand at the tetradecathlon and is now telling her story at the Edinburgh Fringe. But what on earth is a tetradecathlon – and how did the 31-year-old Glasgow native come to take part in this niche competition? “It's like a heptathlon,” Hendry tells me, “but twice as many.” So that's 14 track and field events, starting with 100m hurdles and finishing up with a 3000m run, with a hell of a lot of jumping, dashing and throwing along the way. In fact it was the heroics of heptathlete Jessica Ennis-Hill, who returned from maternity leave to win gold at the 2015 Beijing World Championships, that inspired Hendry. The theatre-maker began Googling the events that constitute a heptathlon, fell down a Wikipedia rabbit hole and eventually stumbled across the tetradecathlon. “I found out about how many events there are in the tetradecathlon and thought, ‘That just sounds stupid’." She noticed that the tetradecathlon world championships had just taken place and found herself scrolling down through the scores. I can relate: a one-time sport-hater, in the summer of 2012 I found myself unexpectedly enthusiastic about the London Olympics. Watching the Brownlee brothers pedal to victory in the triathlon, I wondered why I didn’t have an Olympic gold medal myself? I am, after all, quite tall. So I set about trying every Olympic discipline – from diving to mountain biking, wrestling to volleyball, tennis to weightlifting. Over the course of a year I had a go at them all, sometimes even training with actual Olympians. I didn't manage every single individual event: plenty busy with the 37 Olympic disciplines, I decided that the long jump and the 100m sprint were enough atheletics to be getting on with. Hendry, however, didn't have the luxury of picking and choosing. She immersed herself in a gruelling training schedule with an athletics club, tackling all 14 tetradecathlon events from scratch—100m, 200m, 400m, 800m, 1500m and 3000m running; 100m, 200m and 400m hurdles; long jump, high jump, shotput, javelin and discus—to prepare for her moment on the world stage. It was her first time on a running track. After training for 20 months, the then 30-year-old Hendry was ready to step up and take her place at the 2017 tetradecathlon world championships. But before she had even competed, she was inspired to start working on a show that would tell her story. Having entered a world in which sport suddenly became less about winning and more about achieving a personal best, Hendry wondered if sharing these stories might inspire others to test themselves too. Hendry felt at ease with short-distance running. “I’m naturally a sprinter,” she says. Not so much the longer distances, though to be fair, a range of 100m to 3000m is pretty impressive. Only Mo Farah knows how much Quorn she’d have needed to consume to excel across all those distances. Still, hats off – the four metre long jump she went on to achieve was a far, far greater a distance than anything I ever managed. I had the same revelation when it came to almost every Olympic discipline I attempted. Even boxing, it turns out, is more techique than anything else. You know what else came as a surprise? You're not necessarily going to be good at something you’ve never tried before simply by virtue of being an adult or, in my case, a bit tall. It turns out lots of sports are actually very difficult indeed. In terms of what we can expect to see on stage this August, Tetra-Decathlon is full of exactly these ups and downs and revelations, says Hendry, not to mention the jeopardy of how she actually fared in the competition. Hendry hopes the show will inspire and entertain in equal measure, offering a taste of the “bizarre physicality of athletics” and an electronic score using sounds from the world of athletics composed by Scott Twynholm.